Ali is an experienced feltmaker with a passion for transforming fleece into vibrant felt ‘paintings’. “My work is a response to the wild and beautiful places that abound here in Wales. The seasonal shifts, changing light, colours and textures of the landscape provide endless inspiration.”. Ali is primarily a ‘wet felter’ and enjoys the challenges of this process. Working mostly with ethically-sourced Merino wool, she often incorporates animal and plant fibres, spun yarn and fabrics into her felt pictures to achieve the desired outcome. Ali exhibits widely and has work in several private collections in the UK and abroad. She is a member of The International Feltmakers Association, Origin, Carmarthen and The Ceredigion Art Trail, open studio. Alongside her work, Ali sells a range of greeting cards and is an experienced workshop facilitator. Cwmstwrdy Fibre Farm is a smallholding near Llanidloes, where I breed a small herd of Angora goats and a flock of Bowmont and Shetland sheep to provide fine fleeces to craft workers. I have entered several agricultural shows, winning rosettes for my mohair fleeces and as part of ‘A Crafty Goat Club’. I have traded at Wonderwool Wales, promoting our own home-grown mohair. Mohair and wool are available as raw or washed fibre, in their natural colours or dyed with plant dyes. I weave and knit items such as cushions, blankets, scarves, hats, and socks using my own hand-spun fibre and re-homed commercial yarn. I am a textile designer, artist and tutor with a studio in the Kerry Hills on the Wales-Shropshire border. I design and weave on a 60 inch wide cloth loom. I am intrigued by unusual fabric structures and effects, and use traditional and modern materials to create double cloths, three-dimensional and double-sided fabrics. My inspiration comes from the rhythm, energies and colours of the changing seasons, music and poetry. Dolyfelin Designs is run by Su Pascoe. Su loves to make beautiful, unique handcrafted items such as gloves, hats, scarves and beautiful evening wraps made out of felt and she also enjoys creating pieces of unique jewelery, often upcycling pre-owned materials. Su creates her felted items using mainly the wet felting techniques of Nuno felting and resist felting. She often uses wool yarns to embellish her creations. Moving to Llangadfan 10 years ago with my daughter and her family meant a complete change of lifestyle. We took on 17 acres of Welsh hill and bought 6 pedigree Jacob ewes. The flock now numbers 26 breeding ewes. But what to do with all that fleece? We decided to make decorative and useful items from the wool. I had a background in textile work and my daughter was artistic so we had a go. We could both spin, sew, knit and crotchet and soon added felt making to the list of skills. At the outset we decided not to use any dyes so we blend the natural colours to achieve a variety of tones. We make whatever takes our fancy and due to the nature of the raw material all items are unique. I discovered basket-making by accident, a present from a friend; that was 30 years ago. I make baskets in traditional patterns, using techniques that have survived for hundreds of years. Every basket would have a standard size and shape, and a specific use, such as for fruit and vegetable picking, grain or fish, as well as for domestic use and for feeding animals - too many to mention! If you would like a bespoke basket or more information, you can contact me to discuss your requirements. I design and hand-knit, or crochet, waistcoats, usually building up the garment from modules. These may be squares, diamond shapes or triangles. I use commercial yarns, predominantly a mixture of wool and silk. Each garment is totally unique. I am influenced by the colour and texture of the yarn I am using. At other times I may be influenced by the colours of the seasons, or by something like the form and colours of stained glass, for example. I like to experiment with different shapes and styles and frequently find that the garment seems to dictate its final form as part of the construction process. Specialising in hand-spinning dog combings in the 1980s led me to selling jackets to the top U.S.A. stores. These days, I weave the yarn into luxury rugs, using Peg Loom and Weaving Sticks, which are made for me in Welshpool, and sell nationwide. I also use re-cycled material and charity shop yarns to weave rag-rugs, textile jewellery, bags, fun mobiles etc. and I work with children from 4 years old, using 2 weaving sticks to start with. Classes are held at my yester-year cottage between Welshpool and Oswestry. Circular weaving is always popular, and instructions are in my booklets. 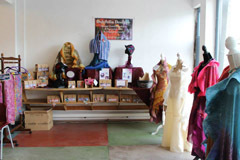 Melindwr Textiles is a small business based in mid-Wales. Crafts and textiles have always been a big part of my life, and I'm glad to have the opportunity to be able to show my work to the community. I up-cycle and re-cycle as much as I can. When time allows, I make garments and knitwear for a charity. Margaret Hughes is the creative mind behind MolliMade. She has many years experiences as a crochet and teacher and brings that experience to The Wool and Willow Festival. Margaret's main interest is in texture and in interpreting nature in crochet. For Wool and Willow she has produced a range of freeform crochet bags and purses and expects to be teaching a workshop on Freeform Crochet. On display at The Wool and Willow Festival will be a selection of hand-dyed wool, kits and made up items together with a large range of crochet patterns for adults, children and the home. Buttons, embellishments and crochet hooks complete the offering. Whatever your level of crochet expertise you will find something of interest on the MolliMade stand. Come and browse: if Margaret is on duty bring your crochet questions and join a front desk demonstration. Nicky Walters is an artist, crafter and maker in many different media, including stained glass, silver & copper jewellery, and paper. Nicky joins the Wool & Willow festival for the first time this year, with her willow weaving, producing items for the home and garden – some useful and some purely decorative! A Member of Valley Arts and Crafts, whose shop is at Lake Vyrnwy, Nicky also runs various art and craft workshops in the area. Please contact her to find out more and be added to her mailing list for future workshops. Out to Learn Willow provides both living willow and dried willow courses and workshops for adults, children and young people within a variety of educational and community settings. I really enjoy spinning luxury yarns, Blue Faced Leicester wool being one of my favourites. I also use a lot of alpaca, which I find is better if blended with silk or wool as it is much too hot on its own! I started spinning many years ago when nice yarns were difficult to find for knitting. When my stash of hand-spun was getting out of control, I learnt to weave. So began my journey with weaving, where the only thing to hold you back is your own imagination and time. Sarah Fisher is an experienced feltmaker, whose central passion is colour. She dyes her own fibres and loves the way in which colours blend and migrate in the feltmaking process. Working mainly with merino fleece, she makes a fine, dense felt, and often incorporates hand-dyed silk. This creates a particularly delicate yet strong fabric which is vibrant and patterned. She often combines wool with other fibres such as bamboo, alpaca, cotton scrim and velvet to add decoration and subtle variations of texture. Her products range from small items such as flowers, jewellery and book covers, to hats, bags and wraps. She also enjoys making hollow 3D sculptures and 2D abstract or semi-abstract hangings. I originally trained and practised as a fashion designer in the 1970’s since then my love of all things textiles has expanded as I have journeyed into the delights of spinning, weaving, felting and dying fabrics with glorious colour. More recently I have used my sewing and dressmaking and dying skills to embrace the re-purposing of charity shop finds, targeting quality fibres, namely men’s woollen jumpers which I slightly felt with a wash in the machine before re-cutting and stitching into flattering ladies tunics and cardigans or vintage wool blankets which take on colour so well and make wonderful bags and cushions. Great fun and very creative. I am a weaver and weaving teacher based near Rhayader. I specialise in weaving highly-textured decorative tapestry wall hangings, combining rustic handspun yarns with scraps of fabric and ‘found objects’ – mainly sticks and stones gathered on my wanderings in the Welsh countryside. I also create a limited edition range of handwoven cushions and throws, again with the emphasis on texture, using rustic handspun yarns. I am probably better known to many as the proprietor of añañuca, a fair trade business which supports spinners and weavers in Chile. Having learnt to weave in Chile I now teach traditional Chilean weaving techniques here in Wales. This very accessible form of weaving requires no expensive equipment; a loom can be built simply from natural wood or recycled materials. I run workshops for the Guild of Weavers, Spinners & Dyers, as well as having taught sell-out workshops at Wonderwool Wales in 2016 & 2017. 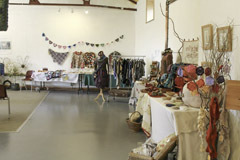 Our provenance: five years at Wool & Willow Festival. Who we are: a crafting family with three generations (10 to 75 years of age), spanning Wales and The Potteries. 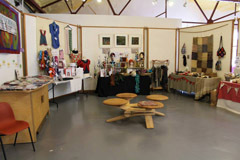 Our skills: knitting, crochet, felting, spinning, hot textiles, re-cycling and wood craft (restoration, turning, carving). Our commitment: to use British natural materials wherever possible, plus colourful commercial materials for variety and interest. Our mission: to promote the old crafts, to promote handicraft as therapy, to use simple form i.e. form follows function . Make a traditional garden trug perfect for collecting flowers or vegetables from the garden. Using a variety of willow you will also be shown how to form a hoop and set ribs for this type of strong and functional basket. Participants will learn how to warp up a weaving frame and weave with a selection of textured weaving and macrame techniques, to create a highly individualistic wall-hanging incorporating handspun yarns, fabrics and ‘found’ objects (buttons, driftwood, beads and shells, etc). Using needle felting technique and fleece from naturally coloured sheep, enjoy sculpting your own miniature badger. The tutor will show you a number of techniques for making felt beads using Merino fleece and the traditional wet-felted method. You can choose from a wide variety of colours; you should make enough to come away with a lovely necklace or bracelet, and have some over for earrings. If you wish, you can learn how to string them using a macramé method of knotting cord. Learn a number of ways of making stunning flowers, using the traditional wet-felted method. The tutor will bring Merino fleece in a wide variety of colours, and you can choose the shape and design you want. Go away with two or three flowers, make into brooches or add stems and put them into a vase. Explore the different rag rug making techniques of hooking, prodding, braiding and standing wool to recycle woollen blankets and garments. At this workshop there will be demonstrations of all the techniques. You will make finished pieces such as badges, trivets, pincushions and cushion pads. A colourful chance to experiment with lots of different tools and techniques. Using basic willow weaving techniques you will create a Willow Dragonfly and separate Willow Flower to display in your garden or home. All Materials provided. Some tools will be available to share but if you have them please bring secateurs and an awl or bradawl, plus an apron or old tea towel. Angels are not only for Christmas! Using basic willow weaving techniques you will create a beautiful 50 cm / 18” Willow Angel to display in your home. Some tools will be available to share but if you have them please bring secateurs and an awl or bradawl, plus an apron or old tea towel. All Materials provided. Learn to needle felt your very own pair of baby owls from natural wools. I will guide you, step by step, through a variety of needle felting techniques during this 3 hour workshop. At the end of the workshop you'll have your very own owls to take home, and if you catch the felting bug, you'll have the skills and knowledge to make more for your friends and family, or come back to make a moon gazing hare. All tools and materials will be provided. In this workshop you will learn the wonderful technique of needle felting to create your very own moon-gazing hare from natural coloured wools. I will guide you, step by step, through a variety of needle felting techniques during this one day workshop. At the end of the workshop you'll have your very own hare to take home, and you'll have the skills and knowledge to make more for your friends and family. All tools and materials will be provided. You will learn how to create a totally unique hand felted hat using a resist technique with embellishments of your choice. On the 2nd day, after your hat has had a chance to dry, you will finish it with hand stitching of brim braid and internal hatband. You will also have the opportunity to design and create a matching ruffle scarf/collar. All materials can be supplied but you are welcome to bring your own. For something being worn next to the skin I would advise only using Merino wool tops. Crochet is infinitely flexible. In this workshop you will explore various ways of working completely free of both patterns and instructions. If you already change patterns, or if you simply know a lot of different techniques and want to use them in more imaginative ways, then this is the workshop for you. We shall look at the basics of how to make freeform garments and accessories in the morning. In the afternoon you will begin your own freeform item. Depending on how large a project it is you may or may not finish it on the same day, but you will have fun and new worlds of crochet inspiration will open before you. You will need a wide range of wools, as well as several hooks with which you are comfortable. This workshop assumes you can crochet and are at least at an improver’s level or better. It is not for beginners. Learn how to make your very own willow hare, a perfect garden sculpture. You will be introduced to several willow weaving and sculpting techniques to help you create this lovely sculpture. I discovered basket making by accident, a present from a friend. That was 30 years ago. I make baskets using techniques that have survived for hundreds of years and traditional patterns. Every basket would have had a specific use, a standard size and shape, and used for fruit and vegetable picking, grain and fish as well as domestic use and feeding animals. Too many to mention. If you'd like to learn how to make yourself a small round basket using these same methods, then come along for a day's workshop. Learn the basic ‘wet felting’ technique to create a simple design or landscape using Merino wool tops, fibres and yarns. Pre-felts can be made during the workshop if needed to incorporate into your final piece. Bring a photo, drawing or image for inspiration, a carrier bag to carry wet work home and an old sponge and towel to keep your work area dry. Learn the technique of Nuno Felting, embedding a patchwork of silk pieces into a felt background using the finest merino wool tops. Make yourself a unique and colourful scarf to match any outfit! All materials can be supplied. Advise that only lightweight silk is used for this workshop. Reading patterns: Can you already crochet but have trouble reading and understanding patterns? Or are you terrified of the diagrams that come with many patterns? This workshop will show you how to understand both the words and the diagrams/charts that come with many crochet patterns. At the end of the workshop you will understand and be able to write and chart your own patterns. We shall make a simple bag as part of this workshop. You will need 50 gm of wool with which you feel comfortable and at least one hook, preferably a 4.5 or 5 mm – or larger. Joins, Borders & Edges: You have spent ages making a lot of squares, or all the pieces for that sweater you really like. But how best to join them all together and finish them off? This workshop will show you how to join pieces invisibly and with decorative joins. It will also introduce you to a few borders and edges. To get the most out of the workshop please bring with you some pieces of work which you want to join and/or edge. We shall be working on your own projects throughout the workshop. Please bring a range of different matching and contrasting yarns.